Have You Seen a Picture of a Supernova? 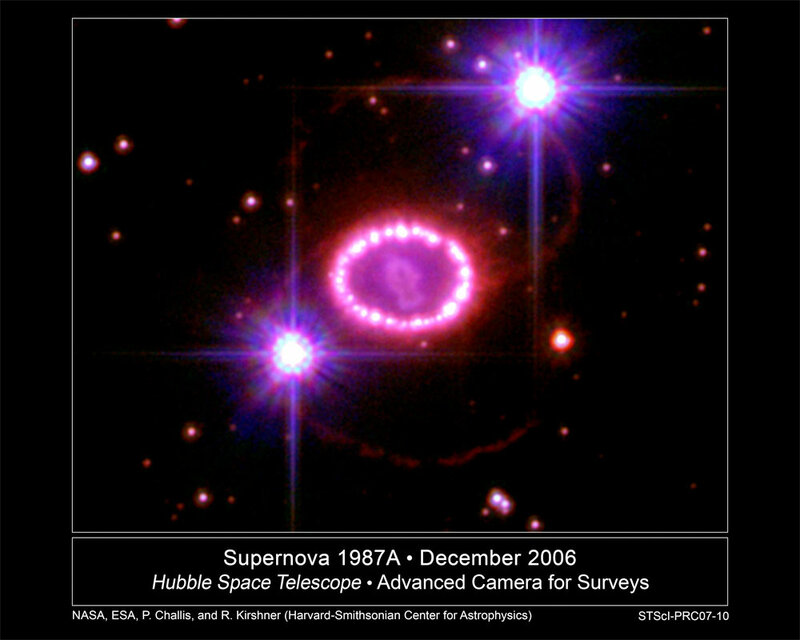 Home » Supernova » Have You Seen a Picture of a Supernova? Supernovas are probably one of the coolest events that happen in our universe. It’s just amazing of the sheer amount of energy these death machines put out. 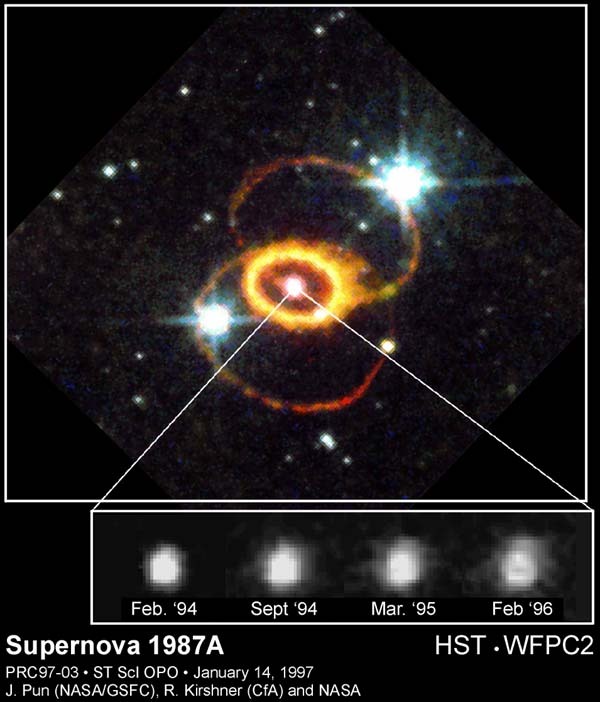 I came across a famous supernova called Supernova 1987A. As I researched the story behind it I gained a lot of appreciation for supernovas and how incredibly hard it is to catch one in the act. 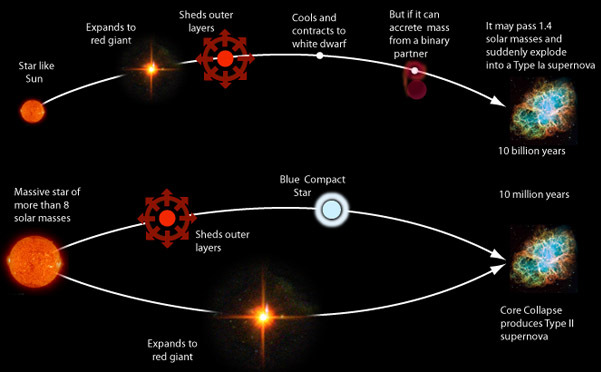 Before I move on to the story let me just give you an overview of what a supernova is exactly. Type I – a star accumulates matter from a nearby source until a runaway nuclear reaction happens. The story on how this was found is pretty cool. It started on a nice clear night on February 23, 1987. The first signal came from the particles called neutrinos, detected far below the ground in Japan and the US. A university of Toronto research assistant, Ian Shelton, was working high up in the Andes mountain of northern Chile and was getting ready for a 3 hour exposure of the Large Magellanic Cloud. When he developed the plate he noticed a bright ,or a magnitude of 5, star that shouldn’t have been there. Shelton walked right outside to investigate further and saw a lively energetic star that exploded 166,000 years ago. At the same time two other astronomers were spotting this star that should not have been there. Albert Jones in Nelson, New Zealand also spotted this and observed it for 4 hours. 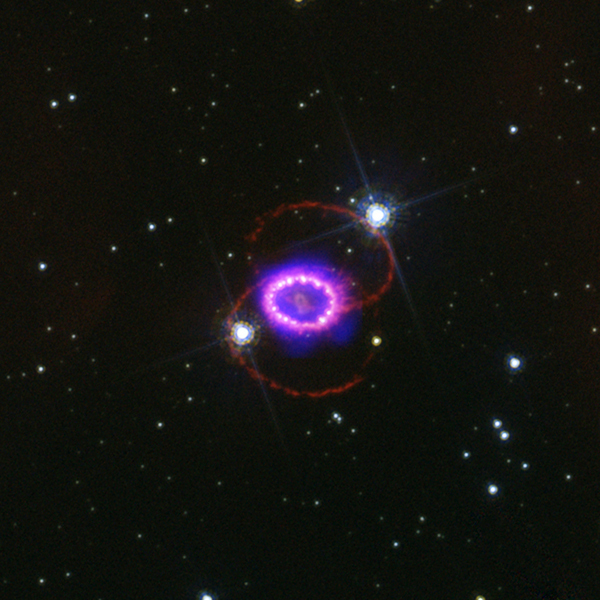 His research provided critical early coverage to this supernova. After that word got around fast telegrams were sent and notified the corresponding groups. Soon followed the AAVSO Alert Notice 92 was released on February 25, 1987 letting the observers know about this amazing supernova. This was the first time and one of the best discoveries of a supernova that was discovered so close to it’s explosion. Now of course it happened 166,000 years ago but observing the light first and being able to study it was truly remarkable. Since then we haven’t been able to catch any supernovas as close as they did in 1987. Here is a little animation of the supernova. So the inside of the ring is the debris left over from the explosion and as you can see it slowly spread out as time progresses each year.